Take a long, slow deep breath through your nostrils with your eyes closed and your shoulders relaxed. Exhale slowly, and allow your whole upper body to soften into the crease in your waist. 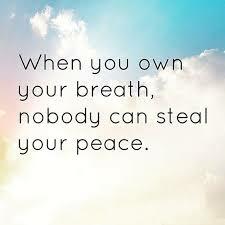 Our breath is an amazing tool to help us in any situation. Focusing on our breathing is powerful—it is a life-force energy that not only keeps us alive but has the ability to calm us and help us stay controlled. Our breath has the strength to influence every emotion in our body. Inhale and then exhale slowly, and with that flow of rhythm, we have the ability to gently dominate how we feel. Bringing our awareness to our breath allows us to hold steady without the intrusion of our minds. With each breath, we awaken more of the positive aura that naturally surrounds us. Every rhythmic breath changes our mood from sadness, panic or sorrow to calmness. The energy of our emotional state of mind can easily shift if we are able to master the art of our breathing. Our Ego is no match for our breathtaking breath of life. Gentle and with an undertow of seduction, our breathing can bring us back to Now. This present moment is all there is. Using our breath to bring us relaxation of the mind is one of the most natural ways to allow us to feel peace. Peace of mind is something that we all strive for every single day. Practice using your breath to help you with everyday stresses. It is a wonderful way to rejuvenate your physical body. Nice, deep belly breaths bring back the sparkle to your wellbeing, and not only do your cells benefit, so does your wonderful Spirit.